The flavors change daily at Ye Olde Cupcake shoppe and are as unique as they are delicious; Better Than Sunshine, Salted Caramel, Chocolate Chip Cookie Dough and Mexican Hot Chocolate are just some of the flavors that adorn the menu along with their sugar cookies, cake pops and French macarons. 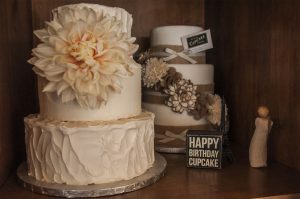 With cases filled fresh every morning and the presentation is truly one-of-a-kind, Ye Olde Cupcake Shoppe in Ogden is quickly becoming one of Utah’s premier destinations for premier baked goods and wedding cakes. Unique is exactly what she got; in addition to creating a quaint shop in the heart of Ogden’s downtown, the baked goods are truly exceptional. The flavors have something for everyone – a fact we can attest to as four taste-testers with very different preferences all left the bakery more than satisfied with our selections. Kids will love the cake pops and sugar cookies while adults will love the more sophisticated subtleties offered in some of their cupcakes. In addition to their standard fare, Shelly and her team have worked tirelessly to perfect their gluten-free recipes, attracting gluten-free fanatics from surrounding states. 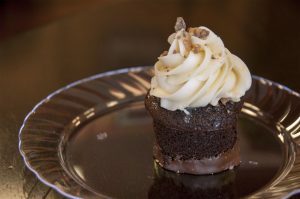 Ye Olde Cupcake Shoppe carries gluten-free cupcakes and cookies daily where many other shops require special orders for these products. The one thing that we can truly say about this shop is that it is charming. The cupcakes are beautiful and cooked in pans not requiring the typical paper wraps that are standard cupcake fare, leaving them with an elegant, polished look that is completely unexpected. The staff is knowledgeable and focused on making sure their customers are satisfied with their selections. While we were conducting our interview, the father of one of the bakers stopped by with a baggie of margarine for a specialty vegan order – a testament that not only do they not cut corners or customer requests but that they will go to whatever lengths it takes to get the job done. “I always want people to know that the most important thing to us is customer service. We want you to trust that the people behind the counter are making a great product that is delicious and always superior. Everything we do is from the heart,” said Seamons. Ye Olde Cupcake Shoppe offers all their flavors in full cake, cupcake and mini cupcake forms. Their versatility allows them to cater to all types of events from corporate gatherings to birthday celebrations and weddings; brides can customize their design and flavor choices to match their wedding esthetic and work closely with the bakers to create the perfect piece for their big day. Customers looking for event consultations for their Utah wedding or reception can call the bakery to set up a cake tasting and consultation at 801-546-8252. Ye Olde Cupcake Shoppe can be found on Facebook at https://www.facebook.com/yeoldecupcakeshoppe/ and on Instagram @yeoldecupcakeshoppe.